A Brookhaven team wants to build the 'fast physics' behind clouds, air-suspended particles and precipitation into global climate models. The acronym for the project Yangang Liu helps lead has a multitude of meanings, he says. It’s called FASTER, for FAst-physics System TEstbed and Research. Its goal is to characterize and evaluate the “fast physics” phenomena of clouds, aerosols (particles suspended in the atmosphere) and precipitation in current and future global climate models. 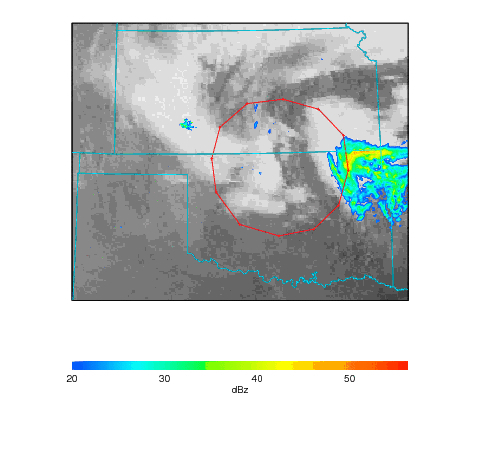 A frame from a WRF, or weather research and forecasting model, that shows an area over Oklahoma where the FASTER fast-cloud physics project will be put to the test. Many physical processes that influence Earth’s climate occur on scales of time and space that are too small to be portrayed by most global climate models. Fast physics denotes all these climatic processes collectively, primarily focusing on processes related to clouds and precipitation. These include cloud microphysics, convection, boundary layer processes, radiation and aerosol-cloud interactions. FASTER is an elaborate collaboration between atmospheric scientists and climate modelers from BNL, Lawrence Berkeley National Laboratory, NASA, the National Oceanic and Atmospheric Administration and seven other universities and institutions around the world. Many came to BNL, on New York’s Long Island, for two days last November to launch the ambitious Department of Energy (DOE) initiative. “The kickoff meeting gave us a forum and the opportunity to review some preliminary results, discuss collaborations and lay out items for immediate actions, as well as let some external experts see the extent and scope of the project,” says ASD head Robert McGraw. Kiran Alapaty of DOE’s Atmospheric System Research program is co-manager of the project, and Peter Daum, chairman of the BNL environmental sciences department, rounds out the project management team. Because most climate models can’t capture fast physics, the processes must be parameterized, or characterized in a way that models can interpret. Global climate models often differ in how they represent the fast physics driving processes like precipitation and aerosol and cloud formation. Those differences are largely responsible for significant uncertainties in predictions of climate sensitivity and indirect effects from aerosols, Liu says. “One of the main goals of the fast physics project is to devise parameterizations based on scientific research and observation and bring them to a form suitable for testbed evaluation and use in the climate model,” McGraw says. Two chief reasons advancement has lagged involve observations and compartmentalized research activities. Modeling and parameterization progress relies heavily on comparing models with observations to discern systematic biases and parameterization problems, Liu says. Traditionally, global-scale evaluation of the way climate models represent clouds has involved comparison with observations such as those from the International Satellite Cloud Climatology Project. Satellite observations are unmatched in covering the globe spatially, but they often aren’t well resolved across time and lack vertical details, such as cloud microphysics and liquid water content, that are much needed to address the fast physics problem. DOE’s Atmospheric Radiation Measurement Program (ARM) was started more than a decade ago to fill this critical need and scientists around the world use its measurements.